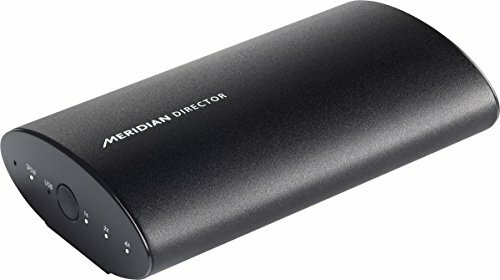 Director is a simple way to enjoy Meridian and make all your digital music sound its best. Director is a high-quality DAC (Digital to Analogue Converter) designed to deliver superior audio quality from any digital source. UPGRADE MUSIC THROUGHOUT YOUR HOME Built in Britain to the same standards as any Meridian product, Director breathes new life into digital sources when listened to on analogue hi-fi systems. Director forms the ideal add-on for network players and music servers with digital outputs, bringing Meridian performance and ultimate sound quality to an entirely new class of audio products and systems. These sound enhancing technologies are derived from the award-winning line of Reference 800 Series components, and significantly out-perform the DACs found in computers and most network players. Director is handmade in the UK with the same precision and craftsmanship as every Meridian product. If you have any questions about this product by Meridian, contact us by completing and submitting the form below. If you are looking for a specif part number, please include it with your message.